This Pied-à-terre has a petite master bathroom with a modernist feel. Utilizing reclaimed materials this bathroom was renewed with natural, handmade and local materials. Recycled vanities make fast friends with wall mounted mirrors made from salvaged barn wood. The vintage Danish pendant light (c.1950-1959) is made of brass and glass. A fiber sculpture by artist Renae Barnard hangs just to the left of a recessed wall niche that provides a perfect space for integrating live plants. Bold minimalism is balanced with rustic details to create this contemporary vintage design. Stainless steel faucets, integral towel bars and coordinating bathroom accessories meld effortlessly with the deep tones of the ebonized vanity. 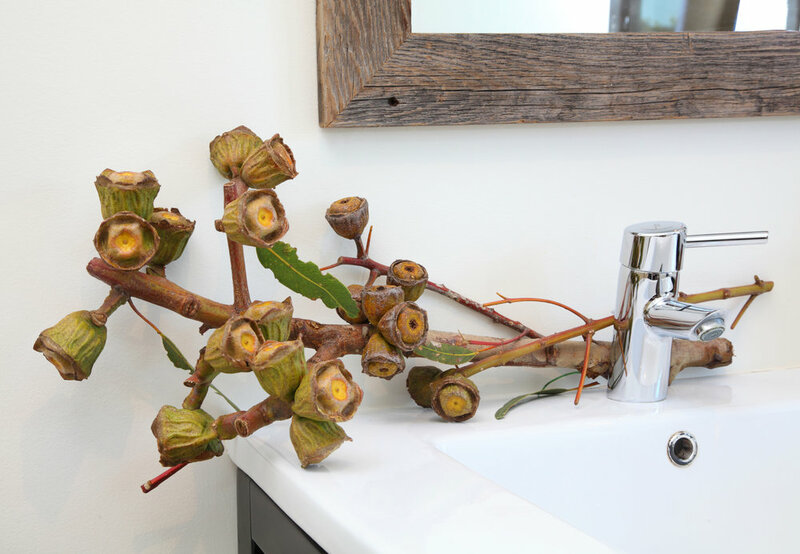 Fresh cut branches add visual interest to the porcelain sinks and bring the outdoors in.